You all are probably familiar with the saying, “tis better to give than to receive” and I believe that is true. What better time to put that into practice than at Christmas time? It’s natural to buy gifts for those who you’re closest to, whether that’s your spouse, children, parents, or best friends. But what if we also considered spreading Christmas cheer to those who live around us and/or serve us every day? By reaching out to our neighbors, teachers, postal workers and others, we can be intentional about thanking them for the investment they make in our lives. Want a simple and surefire way to spread Christmas cheer? Few things do spread the cheer better than delicious baked goods! Not only is this a fun and tasty treat to those who receive them, but it’s also is a great way to get your children involved (and to teach them the value of giving back to others). This Christmas, we chose to bake two of our favorite cookie recipes, which I will be sharing with you. To make sure they were packaged and delivered cheerfully, we used the festive TakeAlongs® holiday containers. As we were buying our ingredients, we chose these TakeAlongs® holiday containers from Walmart! They are SUPER festive, aren’t they? TakeAlongs® holiday containers come in the perfect assortment of Christmas colors, like red, green, and gold. Plus, I love that the recipient can see the goodies inside! We choose multiple shapes and sizes, as each recipient would be receiving a personalized amount for them and their families. ADD dry mix to creamed ingredients slowly, about 1/3 of dry mix at a time. MIX just enough to blend. Then, roll out about 1/3 of dough mixture onto confectioner’s sugar- (not flour!). About 1/4” thick. Cookie cutter shapes. Bake 10 at 350 degrees. Makes about 2 dozen cookies. After cooling, top w glaze. A little consistency at a time, until right. It will continue to thin, so make slightly thicker and let set. For best incorporating of food color, mix with milk as you thin glaze. In mixer, beat butter and sugar, eggs and vanilla until creamy, at medium speed. At low speed, gradually add flour and oats. Stir in chocolate chips. Ungreased cookie sheet-spoon onto, about 2” apart. Bake 10-14 minutes. Makes about 2 1/2 dozen. We had a wonderful time together making these cookies. 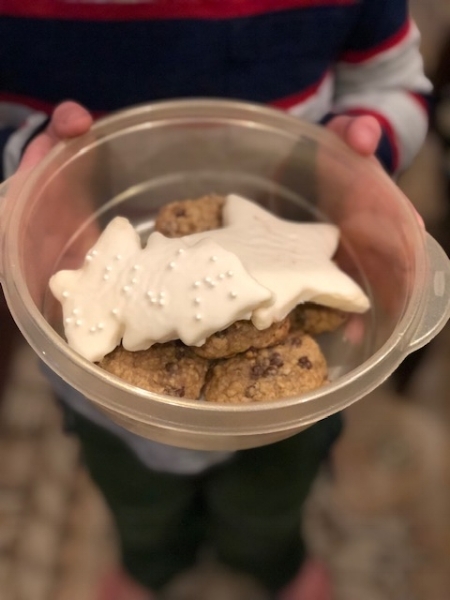 Each of our children chose who they wanted to gift cookies to, as well which color TakeAlongs® Holiday containers to put them in. As you can see, all of the colors were popular at our house. The colors included gold, green and red. Next was the best part, gifting the baked goods to our neighbors, teachers and postal workers. We knew that the TakeAlongs® Holiday containers would keep these treats fresh and make a happy impact on the giving trail. Our family created memories together along the way and what a joy to bring a smile to others. Taking the time to make something delicious for the special people in your life can become a meaningful Christmas tradition for your family. Why not start this year? And by using TakeAlongs® Holiday containers, you can gift those yummy goodies in a festive, practical holiday package. So go spread Christmas cheer today You will be a blessing, and you’ll be blessed too!